In Amadeus, Emperor Joseph II tells Mozart one of his compositions, while ingenious, includes “too many notes.” At Noir City, we tell Emperor Joe to stuff it. 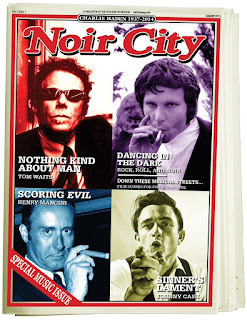 The house rag of the Film Noir Foundation shines its spotlight on music, and we filled this issue to overflowing. Honestly, it’s an embarrassment of riches of which we are inordinately proud, and you owe it to yourselves to secure a copy post haste. My favorite piece, for obvious reasons, is my lovely wife and writing partner Rosemarie’s debut in the magazine. When we finally saw Jean-Pierre Melville’s Deux Hommes dans Manhattan, Rosemarie became obsessed with “Street in Manhattan,” a haunting ballad performed onscreen by a singer billed as Glenda Leigh. Rosemarie wondered whatever became of her and doggedly tracked her down. Now Glenda Grainger, still singing at age 80, she tells the story of her jet-set career in an interview. Plus even more music, as well as our usual coverage of all things noir like my friend David Corbett’s razor sharp appraisal of the best film noir of the 21st century, El Aura, and Duane Swierczynski’s review of the new Blu-ray of Prime Cut. I yammer on about nonsense as well, sizing up a trio of titles that screened at the recent Seattle International Film Festival and serving up my usual Cocktails & Crime column. Contribute to the Film Noir Foundation and this veritable feast will be winging its way to you. Don’t wait.